iOS 6.0.1 has been released, the software update includes several significant bug fixes for all iOS users, particularly those with iPhones. Curiously, those with iPhone 5 must first download a patch that allows OTA updates to work, prior to being able to download and install iOS 6.0.1. The 6.0.1 update appears to address several prominent bugs, including an apparent resolution to the iPhone-specific “No Service” after signal loss and regain problem that impacts a fairly large number of users who are in areas with spotty cellular reception, a fix aimed at the iPhone 5 Wi-Fi speed issue, and a resolution to the peculiar keyboard glitch. The full list of bug fixes is shown below. 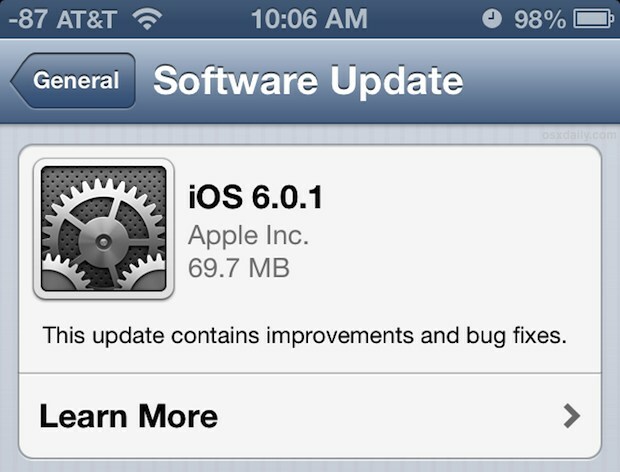 The iOS 6.0.1 software update can be downloaded through iTunes or Over-the-Air Update on the device itself by tapping on Settings > General > Software Update. Direct download links for iOS 6.0.1 IPSW firmware are also be available for those who wish to go the manual route. OS X Mountain Lion 10.8.1 Beta Released for Dev Testing, May Include Wi-Fi Fix? I’m at work so I can’t test the Cellular Service fix, but I am excited to no longer toggle Airplane Mode if it works as advertised! I will know later on my drive home, always lose coverage and it has never regained on it’s own. I just did the upload. Experienced a malfunction – it’s stuck and iTunes is asking to restore to default – will lose ALL media – photos I’m most concerned about. HELP … any Ideas before I restore? As long as you regularly backed up you won’t lose anything. Always a good idea to backup manually before an update though. Wi-Fi seems better again even without custom DNS. Good update. Still cant delete songs/albums/artist properly or at all really using iMatch. Rubishness. Why are you complaining that a third-party app doesn’t work? Don’t blaim Apple for it! Wifi and cell data is more reliable! The iOS 6.0.1 update specifically addresses wi-fi problems, it has helped me. What about App Store and Podcasts updates? Me thinks iOS 6 was the buggiest major release to-date. Me thinks Apple may be too deep in the weeds now and loosing it. Is iOS in a state similar to where Symbian was three years ago before it was unceremoniously killed? I have been having a problem sending videos in messages to other phones. The quality is perfect on my phone but when the next phone receives it, the video is poor quality as well as the audio. Has anyone experienced the same problem or know a fix? Will this update correct older model ‘no service’ issues as well? after updated I was unable to restore my phone from backup. so I lost all my data. Pics, msgs. so frustrated. After I installed update , I have no signal whats the fix? I lost my wifi connection and it won’t locate any wifi ! Please help ! i lost connections. wifi is working though. i tried to contact apple and they ignored my emails. im not reallly happy at all. if you did not test the 6.0.1 why did you publish it from the first place? really a shamed of what im running through at the moment. i cannot answer phone calls. people are just emailing instead. I had horrendous problems with wi-fi with 6, and now even WORSE issues with6.1!!! My phone won’t even discover nearby wifi signals after the update, help please i cant even update the IOS. Blow warm air into the top of phone until te screen says overtemp then turn of and stick it in freezer 10 mins wrapped in kitchen roll.